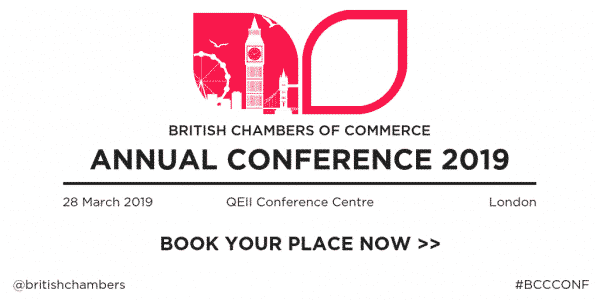 The British Chambers of Commerce’s Annual Conference 2019 will take place on Thursday 28 March at the QEII Conference Centre in London, where we will be joined by senior politicians, business leaders and opinion formers to discuss some of the key issues affecting Britain’s business community. Don’t miss this fantastic opportunity to keep your finger on the pulse and network with businesses and Chambers across the UK. See our website for the latest event updated and speaker announcements. Book your tickets before Friday 15 February 2019 to make the most of an exclusive early bird offer for Chamber Members at a rate of £129+VAT.